With the opening of Subic-Clark-Tarlac Expressway and the Tarlac-Pangasinan-La Union Expressway, going to Baguio City now only takes you four to five hours in the wee hours of the morning. (Yes, it's the same travel time when stuck in a Metro Manila "carmaggedon.") Adding to this convenience is Genesis Transport's newest line of deluxe buses-the JoyBus Premiere Class. In a now-viral Facebook post, Clarence Estandian Inso shared a recent experience with the bus company's latest upgrade. Seats are equipped with touch-screen LCD screens where passengers can watch movies, browse the Internet, and listen to music. (Just make sure that you bring your own headphones or earphones.) You can even charge your gadgets through the USB port by the monitor. There are also tray tables, cup holders, and readily available blankets. 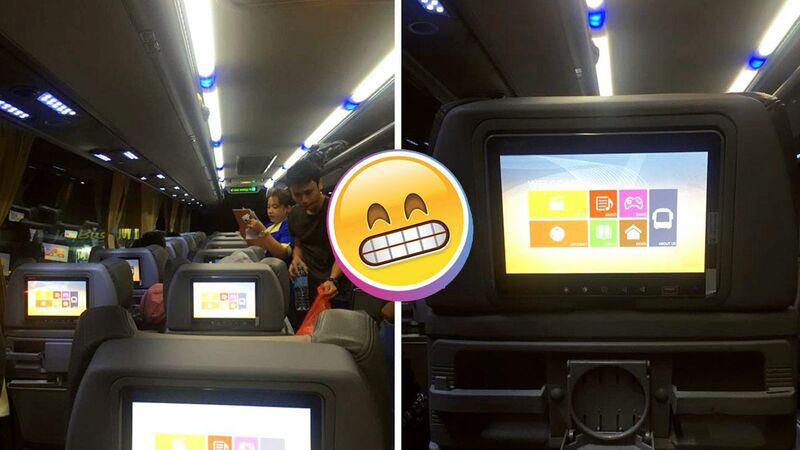 The bus also has a toilet onboard, cutting down on the number of stopovers and lessening the travel time. In an exchange with SPOT.ph, Genesis Transport confirmed that–though a couple of the deluxe buses are already operational–the entire JoyBus Premiere Class fleet has yet to be launched. The route is currently from Ninoy Aquino International Airport Terminal 3 to Baguio City with brief stopovers at the Genesis Terminals in Pasay and Cubao. One-way fare is set at P700, which you can book through their partner websites I Want Seats and Pinoy Travel.